P.S - This is a guest post by an 8 year old kid. The skill of writing is fresh and uncomplicated. I wish all of you to share your feedback to this budding writer. The young writer Siddharth Mago can be reached at siddharth.mago@gmail.com. Share your thoughts with him directly. My name is John and I am a private eye. I was sitting on my couch drinking a cup of coffee in my office, when I heard a loud noise that sounded like a mob rushing to my place. Suddenly I heard a loud bang on door .When I opened the door there was a whole line of angry people in front of me. I asked them one by one. It seemed that all of them had come to complain about a new thief in the valley. My father, owner of a bank too complained. He said “If the thief strikes again we will get his fingerprints thanks to my new fingerprint carpet and I want you to guard the bank at night”. At night when I was guarding the bank, I heard a whirr and I turned around I saw a shadow running past me. The shadow was similar to that of my friend Peter. I followed the shadow and I saw that the thief had entered the bank I followed him and suddenly he saw me and started fighting with me but I dodged all his attacks because I knew that fighting style well, it was the way my friend fought. I thought to myself “Man! This thief is a lot like Peter”. Suddenly he bonked me on the head and I fainted. When I came to, my father was standing in front of me and he asked me what had happened. I didn’t tell him anything because I knew they would suspect Peter. I collected the fingerprint and DNA evidence and went to the lab to test. The fingerprints matched with Peter, I was shocked! I went to Peter’s house to investigate. I decided to tell him that I’d come for a sleepover. When I reached I saw that his sister was living with him. “It would be hard to investigate”, I thought to myself but decided to carry on. At night I sneaked into his room and pulled out a strand of hair from his head for analysis. Back at the lab, after doing the analysis, I found that the hair did not match the hair found at the bank. I sprang up with joy. Just then Peter’s sister walked rubbing her head right at the spot where I had plucked the hair and said, “Oh my head! It feels as if someone has ripped out my hair”. I sat down with disappointment and slight amusement. The test was of no use and I had not succeeded in clearing Peter. The second night I went to my father’s bank to track down the thief. At 1 a.m. 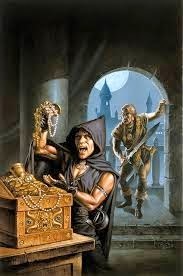 I saw the same shadow and followed it out of the bank, through the streets and finally reached the thief’s hideout. I crept into the hideout slowly and hid behind a wall. I heard Peter arguing with a voice very similar to his. My friend was saying “You must listen to me and stop robbing people. I promised Mum that I would take care of you. Till now I have kept quiet and not informed the police. But this time you have gone too far. You have robbed my friend’s bank. Now I will call the police.” I heard sounds of a struggle. I jumped out to help Peter but as soon as the thief saw me, he grabbed my arm and pushed me. I landed near the open window and fell out through it. I just managed to save myself from falling by holding on to the ledge. Peter rushed to window and pulled me up. In the scuffle between the thief and me I had managed to pull away his mask, but did not get a chance at that time to see his face. As my friend pulled me out, I saw the thief’s face. I was shocked to see that he was a duplicate of Peter As I looked to Peter in confusion, my friend confessed “I am sorry I didn’t tell you this before. He is my twin and is a thief. I was too ashamed to tell you.” Though stunned, I was also relieved that Peter was not the thief. While we were talking Peter’s brother escaped but lucky for us the police had arrived on the scene and managed to catch him. Siddharth this story was brilliant. Loved the suspense. You have brouggt out a lovely moral of the story. Enjoyed reading it. I loved the way the plot twisted and brought something totally new to light. What a fantastic effort Sid! All the very best for your next!